I recently saw my friend Stephanie make these on her fab website Kitchen Frolic and knew I had to make these very Fudgy Beer Brownies too! Stephanie is from Toronto in Canada (a city I love!) and we met after starting our blogs around the same time. It’s been great to see how our sites have both developed in the past couple years. Stephanie also hosts a Cookie Advent Calendar in December, featuring a different blogger, with a different cookie recipe every day. I have been thrilled to be a part of this! But last week, I saw the beer brownies Stephanie had made with Samuel Adams beer. They looked so gooey and delicious I knew I wanted to make them. I decided to use a different tipple to Samuel Adams. A favourite of mine and Disneyboi’s is Blue Moon – a beer that is brewed with Valencia oranges. 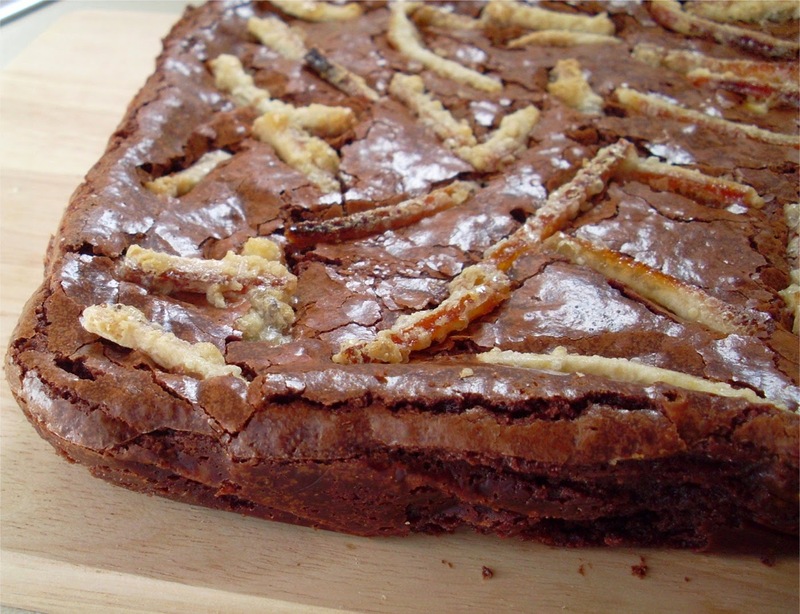 It’s really delicious and so perfect to add to the brownies. Plus I decided to add some candied orange peel to the top of the brownies for added crunch. Firstly candy the orange peel. Cut the peel of the orange into strips about 1/4 cm wide. Pop them into a saucepan and cover with water. Bring them to the boil and then drain. Repeat this two more times. Add the granulated sugar and water to the saucepan and stir together. Pop on the heat and bring to the boil, then simmer for about 8 minutes, without stirring (this causes the sugar to crystallise). Add the orange peel and knock the heat back to low and simmer for 40 minutes. The peel will be translucent and the syrup will have thickened. Transfer the peel to a cooling rack and allow to cool whilst you make the brownies. Cover an 8”x8” pan with kitchen foil, leaving some overhang. Pre-heat the oven to 180C. Bring the beer to a boil in a saucepan, then simmer for 6 to 8 minutes. Allow this cool slightly. In a large bowl add the dark chocolate and butter and place over a pan of simmering water (don’t let the base of the bowl touch the water). Stir until chocolate and butter have melted together then remove from the heat. 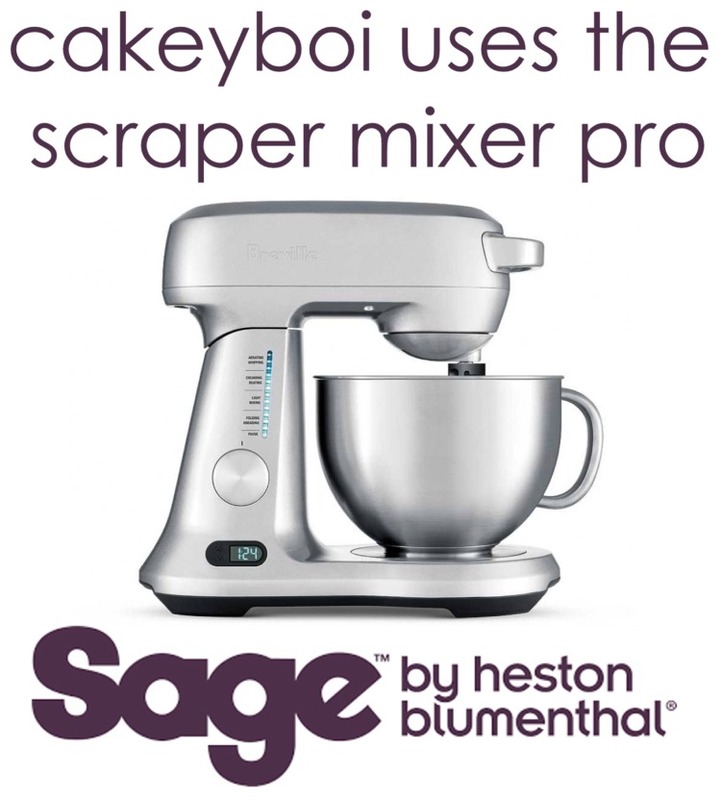 In another bowl, whisk together the caster sugar, eggs and vanilla. Slowly add the chocolate mix, a little at a time then whisk together until smooth. Add 60ml of the reduced beer and stir this in. Lastly add the flour and fold this through. Pour the brownie batter into the prepared pan and pop into the oven for 40 minutes. After the first 15 minutes, remove the pan and scatter the candied orange peel over the top of the brownies pushing it down slightly in the crust which has already formed. Place back into the oven, rotating the pan, and bake for another 25 minutes and then remove from the oven. A toothpick won't come out clean, so don’t worry. Now the hard part – leave overnight (or 8 hours at least). The next morning lift from the pan, using the foil overhang and carefully peel the foil from the brownies. If it sticks a little, use a knife to loosen the stuck bit. 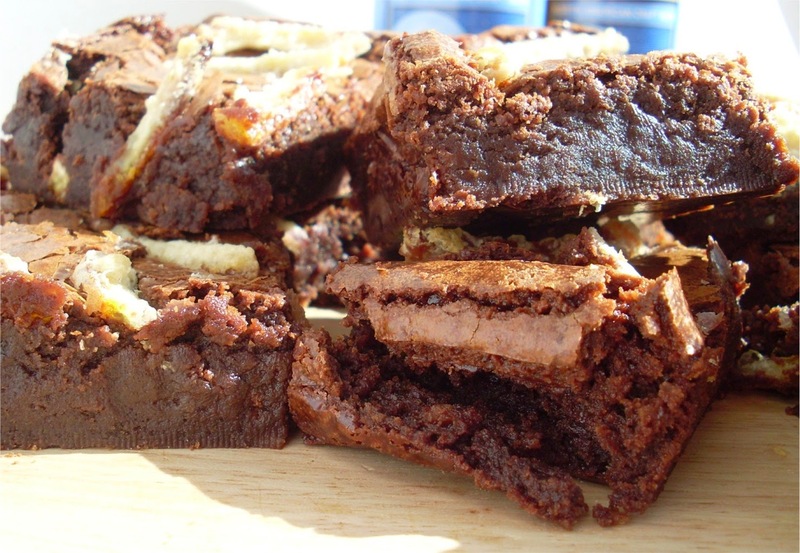 Slice the brownies and there you have the fudgiest brownies you have ever tasted. They are delicately flavoured with the beer and the candied orange peel actually goes crispy on top, giving a nice citrus crunch when you bite in, which compliments the Blue Moon perfectly. A big thanks to Stephanie for the inspiration for this bake and please, please visit Kitchen Frolic. I am entering these fudgy beer brownies into 'Baking with Spirit' hosted by Janine at Cake Of The Week. This month anything that has alcohol and chocolate is allowed. These sound really good! I've had beer chocolate cake but never thought to put it in brownies. I'm intrigued about the candied orange peel on top, too. Thanks for entering Baking With Spirit; it's much appreciated! Thanks for all the kind words! 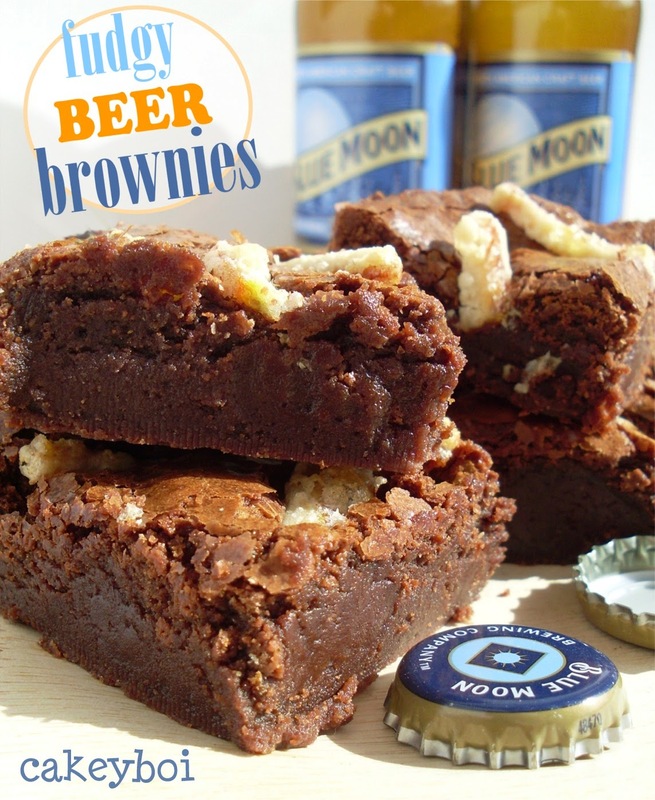 It's so cool to see your spin on the Beer Brownies! I'm sure they tasted as good as they looked - I'm loving the addition of the citrus peel! Will have to give that a go myself! Mmmmm beer! Lovely! 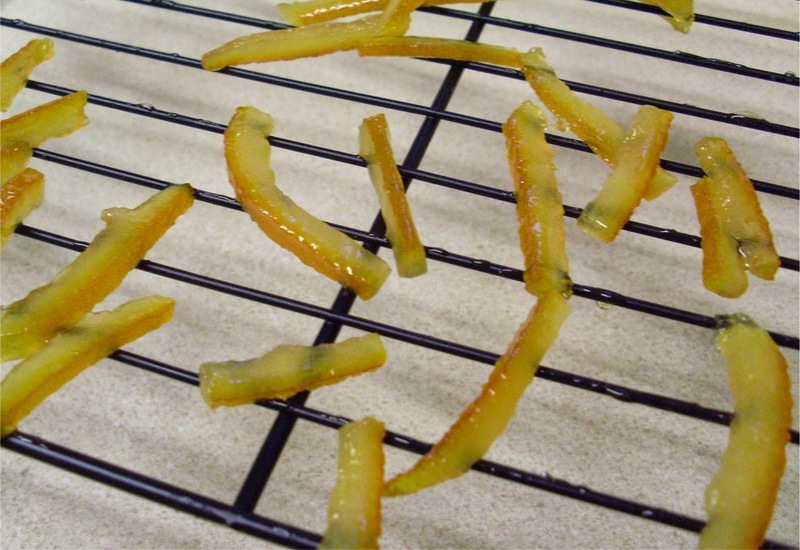 And candied peel too, yum! I love these brownies look awesome!! I bookmarked! I need to note this recipe for when a next need a 'manly' bake!